The reason for such a condition is the missing winter humidity control. What’s that? In a winter (depending on the sizing of the air conditioning and the internal heat loads), the duty cycle of air conditioning is short and infrequent due to the low sensible temperature; therefore, humidity levels may be insufficiently controlled by the condensation on evaporation coils and may need to be controlled by reheat and additional refrigeration. Also, the fresh air intakes should allow just enough fresh air to address air contaminants (CO2) in the building and little enough to maintain humidity intake under control. In many cases, both intentional and unintentional intakes successfully compete with the return air, regardless of the loads. The picture below shows an unintentional fresh air intake, as seen from the return plenum. We diagnose such a condition by monitoring humidity and temperature during at least one full AC cycle, producing a neat chart showing the Dew Point over time. If the peak air humidity nears the upper measurement limits of our instrumentation (95%), this may be a clue that something is wrong. 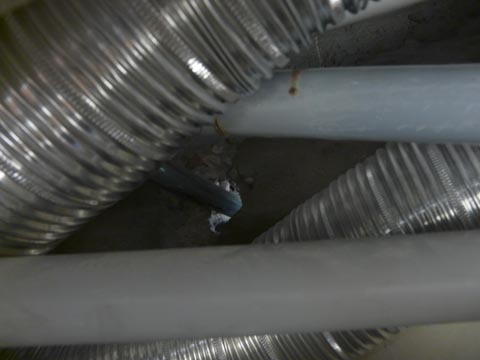 Meticulous observation of the building envelope (including climbing a ladder and sticking head above suspended ceilings which typically serve as return plenums) provides the missing pieces of the puzzle. There is much confusion in the marketplace. Your average AC technician and “home inspector” (and many “instructional” webpages we saw they run) would suggest downsizing your AC unit. This is seldom a good idea unless you have positively verified that the smaller AC would sufficiently address the full loads (internal and external) on a summer design day. This is how mechanical engineers designed them in the first place, so in most cases AC reduction would simply make your summers unbearably hotter. Instead, we suggest that you install dehumidification and humidistats to control the winter humidity in the building. This is how it should have been designed in the first place, but the bad news is that surprisingly many mechanical engineers routinely disregard a partial load condition on a design winter day. It’s easier said than done because most as-built air handlers and fresh air intakes have little space left to add a dedicated dehumidifier to an existing equipment. Also, some systems feature multiple air handlers and multiple fresh air sources. There are many myths about dehumidification. Certainly, the most interesting misapplication we saw so far is the attempt to “dry” the empty building (vacated five years ago because of the toxic microbial growth) by running AC around the clock. The underlying cause of the microbial growth was the vapor retarder on the wrong side of walls. To add insult to the injury, the powerful refrigeration has encouraged the water vapor drive, resulting in more condensation, and the partial load conditions assured the mold and mildew kept growing. Solution? Either switch off the air conditioning or add heating. Old buildings perform best without air conditioning. Dehumidification is a combination of heating and refrigeration. How come? After you get rained and sit wet in you car, the fastest way to dry your clothes is to run full-power AC and full heat: we have to switch it manually from time to time: freezing cold and then steaming hot and again freezing cold… The trick to keep the sensible temperature comfortable is to heat and cool simultaneously, but most cars cannot do it. Your average AC typically can do it after minor rewiring; however, it wouldn’t be very cost effective. 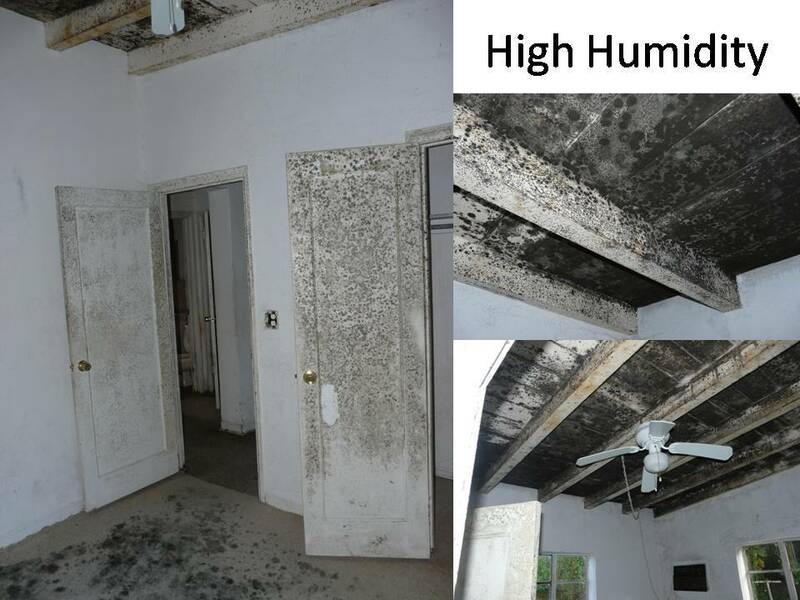 A $300 room dehumidifer added as close as possible to the fresh air intake (or the air handler’s intake if space allows) may alleviate the condition more effectively, according to Dr. Lstiburek.